The US Department of Defense (DoD) expects the size of China’s People’s Liberation Army Navy Marine Corps (PLANMC) to grow to more than 30,000 personnel by 2020, the DoD said in its 2018 China Military Power Report to the US Congress. Released on 16 August, the 130 page-long report states that the corps, which is currently believed to comprise of about 20,000 troops, will consist of seven brigades within the next two years and expand its mission to include expeditionary operations on foreign soil, as PLANMC forces are already operating out of the PLA’s base in Djibouti. The DoD report also pointed out that the PLANMC, which has a newly established headquarters for manning, training, and equipping the expanded corps, may also incorporate an aviation brigade, which could provide an organic helicopter transport and attack capability, thus increasing its amphibious and expeditionary warfare capabilities. China plans to increase the size of its marine corps from about 20,000 to 100,000 personnel to protect the nation’s maritime lifelines and its growing interests overseas, military insiders and experts have said. Some members would be stationed at ports China operates in Djibouti in the Horn of Africa and Gwadar in southwest Pakistan, they said. The expanded corps is part of a wider push to refocus the world’s largest army away from winning a land war based on sheer numbers and towards meeting a range of security scenarios using highly specialised units. Towards that end, Chinese President Xi Jinping is reducing the size of the People’s Liberation Army by 300,000, with nearly all of the cuts coming from the land forces. Military insiders told the South China Morning Post that two brigades of special combat soldiers had already been moved to the marines, nearly doubling its size to 20,000, and more brigades would be added. 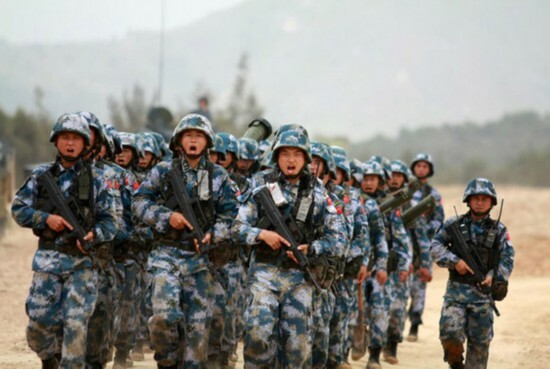 “The PLA marines will be increased to 100,000, consisting of six brigades in the coming future to fulfil new missions of our country,” one source said, adding the size of the navy would also grow 15 per cent. Its current size is estimated at 235,000 personnel.